I have always enjoyed the hobby of photography, purchasing my first 35mm camera at the age of 14. Beginning in late 1989 I firmly got hooked on the world of birds and birding, and along with that, I began photographing them. After years of bird photography I started thinking about wanting more than just static bird photos, and in April of 2001 I made the plunge and purchased a Canon XL1, along with all the other expensive related items I needed. Being a Nikon shooter and having a nice inventory of both Nikon, Tokina, and Sigma lenses, I also purchased a Canon video to Nikon camera lens adapter for the XL1. My current working lens for most of my video work is a Nikon 80-400mm lens, which gives a fantastic reach for those less than cooperative birds, that you can never get close to. With the passing of every year, from the beginning to the present, it has been lots of fun and very educational. With capturing video footage of birds and bird behavior, I have been able to see and learn things that, at times, are not possible to see in the 35mm camera world of just static slides and prints. "EXIT CANON XL H1 HDV - ENTER PANASONIC LUMIX GH3 HD & GH4 Ultra HD 4K"
The Canon XL H1 has served me well, but it's time to say goodby. It's a hard pill to swallow, and seeing it go is like losing a close and long time friend. Tape based video cameras are on borrowed time, and will soon go the way as film did with the introduction of digital cameras. I purchased a Panasonic Lumix GH3 in 2013, a 1080 Full HD camera. In 2015 I purchased a Panasonic Lumix GH4, which is basically the same as the GH3 except for more features like the ability to shoot 2 different modes of 4K and slomo up to 96 FPS (Frames Per Second). Another nice feature is the Edge Detect which is very helpful for manual focusing. Along with a higher resolution LCD and viewfinder, I'm very happy with it. The videos on the right side of this page are samples acquired with the GH3 and/or GH4. You can also visit my Vimeo Channel "LUMIX GH3 miscellanea" to see more sample videos using the GH3 and GH4. Both the GH3 and GH4 was clearly designed as a camera to appeal both to still photographers wanting a Micro Four Thirds SLR style camera system, and also cinematographers looking for a small form-factor camera for shooting high-quality videos. One reason I selected the GH3 and GH4 is that with any lens you mount to the camera, you will enjoy a 2x crop factor. If your using a 400mm lens, it becomes an 800mm lens. My Nikon 80-400mm lens that I used with my original Canon XL1 and XL H1, now can be used with the GH4 with the use of a M4/3 to Nikon lens adapter. In fact, there are third party lens adapters for nearly every lens that has ever been made. Since the GH4 with the Nikon lens is manual everything, I purchased a Panasonic 100-300mm that is auto focus and has image stabilization. Now for the main reason I bought the camera, it has something called ETC (Extra Tele-Converter) mode. ETC crops the center 1920X1080 segment from the camera's sensor. This increases the apparent focal length of the lens in use by 2.4X, but also means that the data is straight from each individual pixel, no downressing, binning, resampling or line skipping. In short, there is absolutely no loss of resolution or quality. This means that if your using a 400mm (800mm) lens with the ETC function (2.4x), you now are enjoying a 1920mm lens. I know it's not the same as the XL H1's 7.2x magnification factor which gave my NIKON 80-400mm a 576-2880mm reach, but this fact hasn't prevented me from getting good wildlife video, I just work smarter in getting a little closer to the subject. In 2017 I replaced my Nikon 80-400mm lens with a Panasonic/Leica 100-400mm lens, which is a Micro Four Thirds mount and requires no lens adapter. This lens is very sharp and allows me to enjoy auto focus and IS, which I didn't have with my Nikon 80-400mm. THE ECUADOR ADVENTURE WITH "BIRDMAN"
In 2006 and then again in 2007, for a total of 6 weeks away from home, I was privilaged to accompany my long time friend, Tim Barksdale AKA "Birdman", to Ecuador to help shoot a pilot for a conceptual birding series for TV broadcast called "Adventures With Birdman". The series, "Adventures With Birdman" is one wildlife cameraman's personal quest to find, film, and share some of the world's rarest, elusive, and most critically endangered birds. A dedicated film maker, conservationist, and birder, Tim Barksdale's mission is to bring awareness for the need to protect and provide habitat for, not only these endangered birds, but all the world's wildlife before we lose them forever. The pilot, "Search for the Jocotoco Antpitta" is about the search for a small critically endangered and elusive bird that was discovered and new to science in 1997, and only found in an isolated small area in the high Andean rain forests of Southern Ecuador, namely the area in and around the Jocotoco Foundation's Tapichalaca Reserve. You can see a few short clips from the pilot at "Adventures With Birdman" on Vimeo. This project could never have been completed without the help and generous support from the Jocotoco Foundation. Any donations to this recognized world leader in wildlife protection and conservation, would gladly be accepted and appreciated. Please contact me for price quotes, which will be based on several factors such as species, action or interaction, quality, and difficulty in obtaining the footage. Special pricing consideration might be given to bonafide non-profit wildlife conservation organizations. If you are a government agency, university or a PBS production/project and say you don't have a budget, please go and find a budget, and then then come back and talk to me. Giving photos and video footage away for free or at below market value not only hinders my ability to get out and obtain footage, but does a disservice to my fellow wildlife photographers and videographers who depend on sales as part or their primary source of income and livelihood. I have many bird species, mostly Western United States, shown on several different Internet sites listed on this page, but if you need a species that you don't see, please contact me at my email address below, because I might have it in my video library. XL H1 footage is HDV 1080/60i, 25Mbps, and is delivered as native HDV 1440x1080 MPEG-2 files. GH3 and GH4 footage is Full HD 1920x1080 (GH4 UHD 4K 3840x2160) 30p .MOV. Video footage can be delivered on DVD or Blu-ray disc, via an Internet Drop Box, File Sharing or FTP site. With the migration from photography to video, I soon found myself giving video programs to Audubon groups around the Southern California area, instead of my usual slide programs. Once I became comfortable with video editing, the next logical step was to put all the footage I had been shooting on DVD. At the present time I have (4) 60 minute standard definition DVD's and (6) HD Blu-ray disc to offer. These make great gifts anytime during the year. They are also great for all age groups as an introduction to the wonderful world of nature and birdwatching. 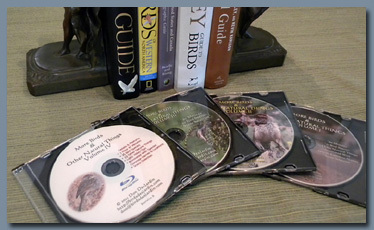 The videos shown on my "CRITTERS" page, along with my IBC videos shown to the right on my "VIDEO & DVD" page, are samples of the content and quality that you will enjoy in "More Birds & Other Natural Things Volume III, IV, 5, & VI", "A Collection Of Short Videos" and "An Introduction to the Birds of Ventura County". All DVD & Blu-ray discs are authored with "Play From" locations base on minutes from the beginning or actual videos. "More Birds & Other Natural Things Volume III"--This DISC is mostly Ventura County birds, but it also includes a few from Santa Barbara County, Kern County, and SE Arizona. Also included are a few other "critters" found in the wonderful world of nature. One of the highlights of this DISC is an up close visit with two California Condor, an immature male #457, and an adult male #282. All species, both birds (64) and other natural (3) are annotated with species common names and locations. The format is 16:9 widescreen NTSC and is 60 minutes (Blu-ray 60 minutes) long. "More Birds & Other Natural Things Volume IV"--This DISC is mostly Ventura County birds, but it also includes some great birds from Santa Barbara County, Imperial County (Bean Goose), Kern County (Le Conte's Thrasher), San Luis Obispo County (Ivory Gull), and Ventura County (Indigo Bunting). All species, both birds (66) and other natural (8) are annotated with species common names and locations. The format is 16:9 widescreen NTSC and is 60 minutes (Blu-ray 60 minutes) long. "More Birds & Other natural Things Volume 5"--This DISC is mostly Ventura County bird, but also a few from San Luis Oispo and Imperial Counties. All species, both birds (60) and other natural (3) are annotated with species common names and locations. The first 45 minutes are all birds, and the last 15 minutes is a short video "Dawn to Dusk at the Salton Sea". The format is 16:9 widescreen NTSC and is 60 minutes (Blu-ray 60 minutes) long. "More Birds & Other natural Things Volume VI"--This DISC is mostly Ventura County bird, but also a few from Santa Barbara and Imperial Counties. All species, both birds (84) and other natural (5) are annotated with species common names and locations. The format is 16:9 widescreen NTSC and is 60 minutes (Blu-ray 70 minutes) long. This DVD and Blu-ray is my first project comprised almost entirely of footage shot in Full HD 1920x1080 using the Panasonic Lumix GH3 camera. The quality of the DVD, and especially the Blu-ray, is awesome. "A Collection Of Short Videos"--This DISC features 14 short bird videos and 1 nature video and includes content not shown on the "More Birds & Other Natural Things" series and is 90 minutes long. The Blu-ray is a single disc and the DVD version is a 2 disc set, but priced as a single disc. "More Birds & Other Natural Things Volume III"
"More Birds & Other Natural Things Volume IV"
"More Birds & Other Natural Things Volume 5"
"More Birds & Other Natural Things Volume VI"
"A Collection Of Short Videos"